In 2004, Sai devotee, who was searching for Sai temple in Singapore, disappointed by his failed search created yahoo group to search like minded people desiring to create a Shirdi Sai Baba Centre in Singapore. After few months another Sai devotee like him joined the yahoo group. Together they decided to approach more Sai devotees like them and should form society. It is decided that the Society would devote its energies to celebrate the life and teachings of Shirdi Sai baba only. Devotees were contacted and the minimum 10 members needed to incorporate a Society in Singapore were identified. After long process of incorporation, on 2 June 2005, with approval of Ministry of Home Affairs in Singapore , Shirdi Sai Baba Sansthan(Singapore)'s stone had been laid. For the beginning Society decided to conduct Bhajan session on a weekly basis on Saturdays. For that they approached Shri Vadapathira Kaliamman temple and with the grace of Shri Sai baba temple agreed to their request thinking it would be a just a one-off event, and the first session of Sai Bhajans happened on 19 November 2005 at the temple's multipurpose hall. Sai sansthan's first AGM was held on 19 march 2006 and a new management committee was elected. During early days, the Bhajan sessions were very simple but with passing years when more devotees started attending prayers, Sai Sansthan started organizing more activities during special days. However, the lack of a dedicated space for conducting Bhajan session was an impediment often the group had to make do with alternate makeshift venues for the sessions during festival seasons or other special events at the temple. Thanks to the philanthropist and because of his efforts Sai Sansthan's this problem has been solved and the 3rd floor function hall of the Sri Vadapathira Kaliamman temple is secured and converted to a full fledged exclusive Shirdi Sai worship centre. 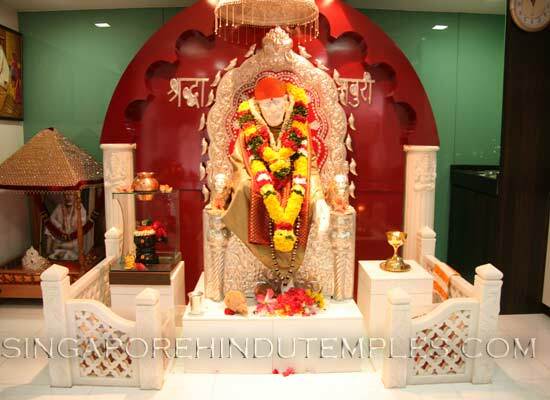 The interiors of the hall were quickly renovated to create a magnificent temple within a few weeks; a marble idol of Shri Sai Baba was procured from India and was formally installed at the temple on 5th February 2008. At an EGM held on 20 January 2007, it was concluded that the existence of the Society is now superfluous. A resolution was passed to dissolve the Society. Once Temple started conducting all pujas and aratis in full accordance with the traditions laid out but. the Shirdi Sansthan, Temple employed a full time pundit who is well qualified in the Hindu scriptures and Puja procedure. Unique feature of this temple is - the management and routine operation of the temple is completely in the hands of informal team of volunteers. This team is neither defined nor bestowed with any formal authority: devotees are free to take up any activity and serve.